The stock market bubble in the United States peaked in March of 2000 and then collapsed. The Fed lowered interest rates to 1% allowing credit to flow freely to consumers and the money supply exploded higher. This caused a resurgence in the stock market, but was felt at an even greater scale in the real estate market creating a bubble of massive scale. 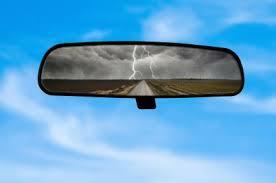 People felt that the worst was behind us and with the storm now in the rear view mirror it was only blue skies ahead. In 2008 we found out that the Fed's euphoria was only an artificial facade and all markets collapsed as reality began to sink in. Since that point we have seen an unprecedented combination of global central bank liquidity injected into the financial system in combination with governments around the world running massive deficit spending in order to try and "stimulate" the global economy. 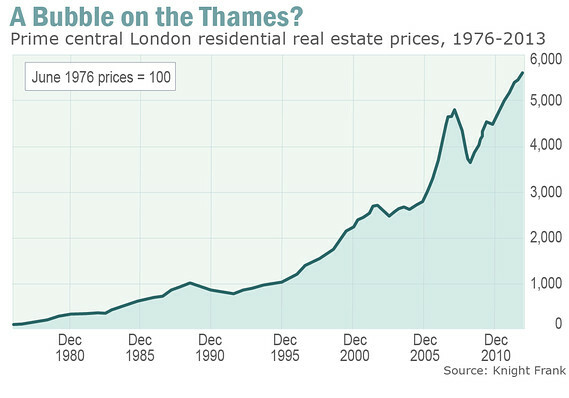 This has caused a resurgence in the stock market and more recently in the U.S. real estate market (many global real estate markets never corrected - see the incredible chart of London real estate prices below), but was felt at an even greater scale in the bond market creating a bubble of massive scale. People feel today that the worst is behind us and with the storm now in the rear view mirror there are only blue skies ahead. Many people feel that what occurred in Europe from early 2010 to the summer of 2012 was the peak of the sovereign debt crisis. What they do not understand is Europe was only a side show for the coming main event. The true crisis will come for the four pillars that represent the major developed nations of the world; the United States, the U.K., Europe, and Japan. It has been my assumption over the past 18 months, which I have documented here in endless detail, that Japan would be the first to crack. It could just as easily be one of the other three regions, but the fundamentals for Japan are by far the worst (ironically, when looked at as a whole Europe is the best). This was exactly the scenario the Bank of Japan wanted. It is the exact same scenario that every central bank has wanted (and has received) since the massive global QE programs have begun in 2008. 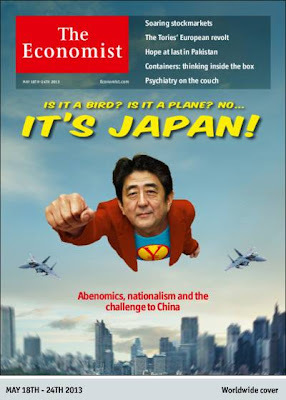 Then something very unexpected happened in Japan; government bond yields began to surge. The 10 year government bond yield rose from close to 0.40% to over 1.0% in just a matter of days. This is a serious problem as rising yields will bankrupt the government quickly, a topic I have discussed in detail in the past. The equivalent move in the United States would be if the 10 year treasury moved from around 2% where it is today to 5% (this is coming). While I could write a book on what this will do to the U.S. economy (besides bankrupting the government itself with skyrocketing interest payments), just briefly imagine what it will do to the real estate market as mortgage rates move from the high 3% range today to well over 7%. Interest rates moved up significantly around the world over the past two weeks when Bernanke uttered the word "taper" during his most recent testimony. The 10 year treasury rate yield had its highest one day rise in 19 months touching 2.21%. This is the true crisis, which has not even begun yet. We have not begun to atone for the sins of pushing forward the bill of 70 years of debt accumulation. It is almost time. Unlike during the financial crisis of 2008, this time when we enter crisis the central banks and the governments around the world will already be "all in." Saving the bond markets will prove far more difficult that saving the stock market in 2000 or the real estate market in 2008 because the size of the government bonds markets are enormous in comparison to both. Bond prices falling will create losses on the balance sheets of pensions, insurance companies, banks, and the average person's 401k just as stocks and real estate losses do. The following shows the size of the U.S. government bond market (red) in comparison to the U.S. stock market (blue). This comes at a time when investors are most optimistic about the future than at any other point in history. Valuations are reaching insane levels in almost every asset class across the board just before they will collapse. The the time to be most afraid is when others are most optimistic. As I have discussed since the year began, cash will soon be the most desired asset class on the planet. Make sure you have some before the rush begins. Tuna, are you expecting a deflationary cycle to set in? In the US or worldwide? Or both? Property prices in Asia, for example, have shot through the roof with supply greatly exceeding demand. Any thoughts on that? I am expecting one more disinflationary cycle to occur where you will see a sell off in risk/high yield assets. I do not know if the actual money supply and credit will contract (deflation) during this period as it did briefly during 2008. A large portion of the new money (inflation) created since 2008 has moved into high yielding assets (stocks and bonds), which is why it has been hidden from the public view so far. I expect a reversal of this trade, and then I expect during the next reflation move higher, money will be highly concentrated in the commodities sector to finish out its secular bull market. I think certain markets in Asia are experiencing a huge real estate bubble, which when it reverses, will have enormous negative implications for their economy as a whole because so much of their GDP is currently tied to real estate development. Bigger picture I think this century will belong to Asia and while they will have enormous set backs along the way, capital will perform best in their emerging markets over the next few decades.